Enerpac sales and service centres in Australia achieved a remarkable landmark this year when Parks Hydraulic Services’ Trevor Tranter handed over ownership of the business to Greg and Jo Maher. Formerly owned by Bill Parks for 30 years until Tranter took over in 1998, the Abbotsford, Melbourne, business has become a standard for personal service and long-term relationships with customers. Maher, who are only the third owners in nearly 40 years, aim to maintain the family-owned business’s winning traditions, and to sustain the strong relationships it has forged with both customers and with quality suppliers such as Enerpac, which has built its reputation on 50 years of commitment to product and service quality. 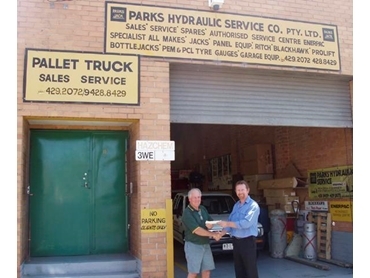 “After 34 years at Parks Hydraulic Service I have decided that its time for a sea changes,” says Tranter. “Bill Parks said when he retired that we win out in this business because of the experience here - we don’t just sell a few cheap jacks, we support and service quality ranges, such as the Enerpac high-pressure equipment, with which we have decades of experience. We can specify and give customers good advice on what they need - that’s why we get repeat business”. “Over the years the industry has seen many changes but good service and good product have always been in demand and Parks Hydraulic Service has always moved with the times. Greg Maher says he is thoroughly enjoying his new business and could not be happier than to have Trevor teaching him the ropes.